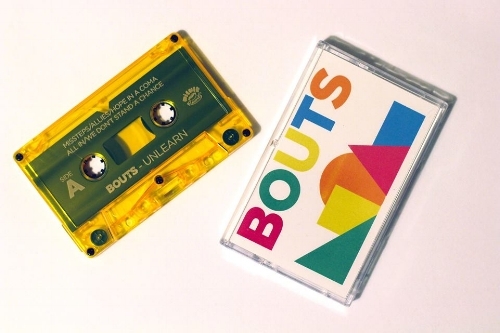 is the music of Bouts – in the form of the sensational cut, Face Up. Barry from the band tells me about their current song and what we can expect going forward; how the chaps got together in the first place – whether they have moved forward and evolved as a unit since their earliest days. I learn about some cool new acts; if there is a treasured memory for the group; where we can catch the guys play; what Bouts want to achieve before the end of the year – Barry choose a song to end the interview on. Barry: Our week has been full of intrigue - as we try to agree our upcoming record’s tracklisting and celebrate receiving the finished masters (even though the record won’t see the light of day just yet). So…a mixed bag. Energetic, enthusiastic; melodic, guitar-centric tension and release. It’s like Emo without the melodrama; like Grunge without the moshing; like shoe-gazing without the shoes. What is the story behind your new single, Face Up? Was it a track that naturally came together? Yes. it came together very quickly in a remote house in the west of Ireland at the start of 2017. It was almost fully-formed at inception and has barely changed since (we even have the cellphone footage to prove it). We knew it was an exciting track with an immediate hook and, hopefully, by now we have a radar for that sort of thing. It definitely wasn’t going to allow us to let it slip away like many ideas often do. The song has already been gathering love and support. Does it give you energy and purpose knowing your songs connect so freely? That’s a very kind, leading question! We certainly hope our songs connect. It’s more and more of a challenge to grab people’s attention these days. Spotify is such a plentiful environment that our attention spans have reduced as the access to music has multiplied exponentially. Although, having said that, a good song will always stand out. A cliché but a damn accurate one. Is there more material coming later in the year? A second single from the album will be released over the summer, with possibly a third to follow in the autumn - and the album most likely early-2019. How do you think you have progressed as a band in the past few years? We’re more relaxed. Ironically, we’ve grown together as individuals even as our geographical dispersion has become more pronounced (we live in Ireland, the U.K. and the Netherlands). I guess there is a growing maturity. Our slightly frenetic, in-your-face sound of the earlier stuff has dissipated into a more-rounded and concentrated type of approach both stylistically and in songwriting terms. How did Bouts get together? Did you all bond over shared tastes? We all shared very similar and complementary tastes. We liked our Pavement, Pixes; Thermals, Grandaddy and Nada Surf etc. That made things easy at the start for sure. We would often go to the same gigs and a couple of us had overlapped in different projects before we got together. I think, more recently, we listen to stuff like Speedy Ortiz, Francis and the Lights or Blood Orange, but have a soft spot for our old-skool Indie-shmindie. Is Dublin a great place to make music? What is the vibe like there right now? Well. Only two of the four of us live there now so we can’t fully vouch for the current vibe. As a place to make music generally, though, Dublin has always been comfortable and supportive. This comfort can be both its strength and weakness. There is an undoubted tight-knit community around each scene and people doing great work as both artists and producers. We’re lining up a few shows in Ireland and the U.K. between now and the end of the year - but expect much more from the beginning of 2019. To re-enter people’s consciousness as a group (we’ve been dormant for most of the last four years) and let everybody know that good Indie-guitar music – or whatever label you want to put on it – are far from dead and buried and, indeed, something to embrace as essential again. I probably speak for all the guys when I say that playing after the great Bobby Womack and before Emeli Sandé at a concert in Dublin (in 2013) was probably our weirdest collective memory moment. Also, the Brooklyn apartment we stayed at during CMJ in New York - back in 2012 - had an old Victorian free-standing bath in the kitchen. It was the only way of washing ourselves and certainly made breakfast…interesting. We partially fulfilled that when we supported Cloud Nothings in Dublin a few years back. We are all huge fans of Dylan Baldi…perhaps Stephen Malkmus, though. He’s just such a legend. A rider consisting of some nonsense, hipster craft-brew beers, hummus; carrots, crisps; salty chocolate and a non-fussy assortment of triangular sandwiches would also do very nicely, thank you very much. Write, write, write. You may knock out a couple of decent tunes initially through sheer energy, excitement and talent but, to keep doing so consistently, you need to recycle idea after idea, learn to recognise good from bad; develop an internal quality control radar, broaden your influences as much as possible and then realise, after all that, that maybe you can now actually write semi-decent tunes. It takes literally hundreds of attempts (and many bands) to get there though. Now, Now, Snail Mail; Krystal Klear, Forth Wanderers; Soccer Mommy and (Sandy) Alex G.
We’re all pretty consistent and heavy travel-addicts – also, badminton. But, maybe I’m speaking for myself there….